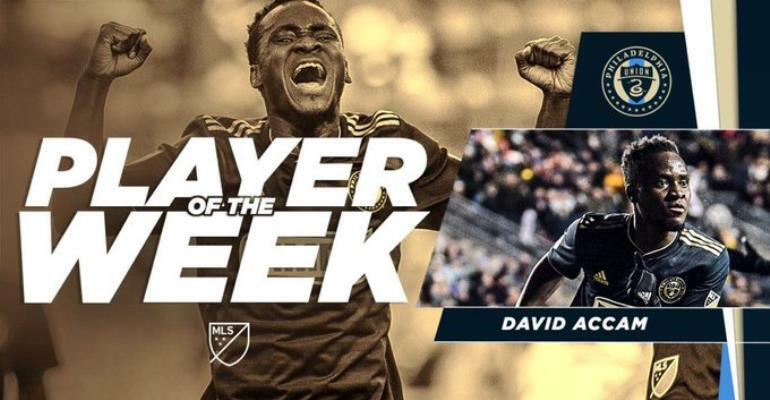 David Accam has been voted MLS Player of the Week after inspiring Philadelphia Union to a 3-0 win over Columbus Crew on Saturday. The Ghanaian forward scored a brace in a man of the match performance as coach Jim Curtin's side recorded their first win of the MLS season. The 28-year-old beat off competition Kenny Saief of FC Cincinnati, Los Angeles FC midfielder Walker Zimmerman and Orlando City’s Sacha Kljestan. The pacy winger will expect this performance to boost his morale as the season continues, following a very difficult campaign last year, where he scored just a goal in 23 appearances. The former Chicago Fire forward dedicated the brace to his father who passed away last week. Accam's form could get him a look in Ghana coach Kwesi Appiah's team for AFCON 2019.